Welcome to Katfrog's Corner: Wordless Wednesday - Fire!! Last Sunday, my family and I went out to test drive the new Toyota Sienna (I want one!!!). Afterwards, we grabbed a nice lunch at a local Colombian restaurant and started to drive home. A huge black cloud of smoke billowed nearby, so we decided to investigate. We found this burning truck on the side of the interstate, with a man in an orange shirt watching the truck burn, cell phone in hand. 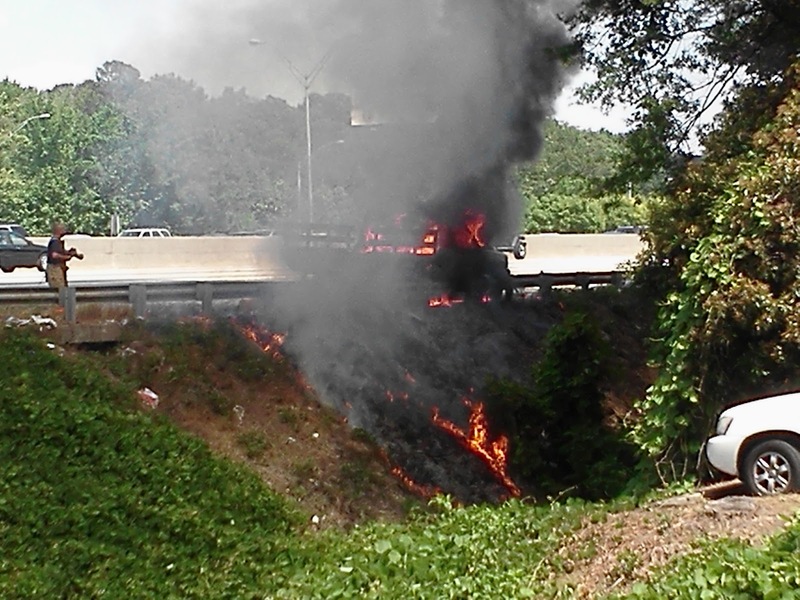 The fire consumed the passenger compartment of the truck, and began working its way down the adjoining hill. I immediately called 9-1-1, and as the 9-1-1 operator thanked me for the call, the fire truck rolled up. A firefighter (in the left side of the photo) calmly grabbed a host, walked up, and proceeded to put out the fire on the hill before dousing the truck fire. It took him less than 60 seconds. This post is dedicated to the Cobb County Fire Department. Thank you for once again doing your job, and doing it with style. OMG! How freaking scary. I hope nobody was hurt. Thank goodness for firefighters! Looks like it could have been serious, good job guys!